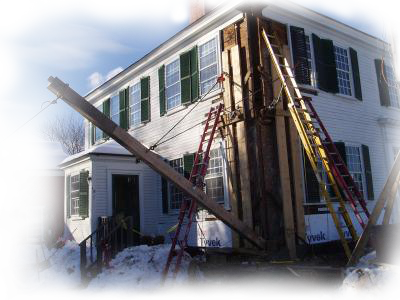 Since 1981, Colonial Restorations, LLC has provided structural restoration and repair of historic timber frame buildings. Tom Green started the business in 1981 after graduating from University of Massachusetts. His love of older buildings and craftsmanship was passed on to his son Brad who has been in the field since he was twelve years old. Upon graduation from Wesleyan University in 2000, Brad decided to make a career of it. Brad has been running the company since 2015. 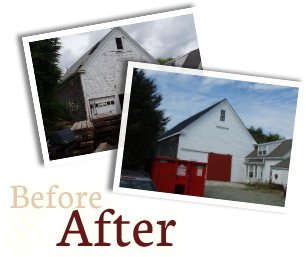 Colonial Restorations does all the work themselves and never use sub-contractors. This ensures every project is done with the love and care these historic buildings deserve. They have done many projects that other contractors would have torn down the building and built new, which would have destroyed a piece of history. Colonial Restorations works all over New England and has done projects as far away as Pennsylvania and the Hampton’s on Long Island. They consider projects almost anywhere. Not many people do what they do and do it well so they stay very busy. If you are considering a project in the next couple of years, it is important to contact them well in advance. Colonial Restorations, LLC works on both residential and commercial projects. Mother Nature is always full of surprises that can affect buildings without people realizing it. 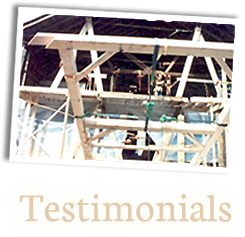 If you have any questions about how the structure of your building is holding up, please Contact Us. If you are considering the purchase of an older property, it is very important to have a pre-purchase evaluation done by Colonial Restorations prior to closing. 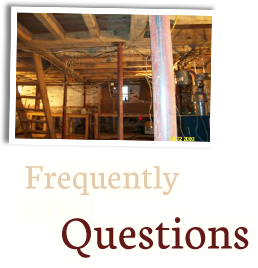 Home inspectors know a little bit about everything but they are not specialists. It is also important to know the costs involved for any structural repairs prior to purchasing the home. There is nothing worse than buying an older home and discovering afterwards that there is significant structural damage. To know these buildings as we do is a privilege. “To know how to do something well is to enjoy it”. And every day we find this to be true. History has a way of repeating itself. In the early-mid 1980s, the savings and loan crisis caused a recession in the building trades. In many ways, the past several years have seen economic problems and challenges similar to then. Some builders tried to provide themselves an income by expanding the services that they offered. With no real timber frame experience, they often advertised sill replacement and structural work relating to post and beam buildings. Unfortunately, they often lack the practical experience and love of the antique buildings to do the job successfully. There is an old story about a small New England town. It seems a new barber moved in and put up a sign offering three dollar haircuts. Soon after the original barber put up a sign in his window saying “We fix $3 haircuts”. It is fair to say that Colonial Restorations has fixed many three dollar haircuts over the years. Colonial Restorations, LLC was recently awarded the Angie’s List Super Service Award recognizing their continuing excellence in the field of restoration.